East of east is another way of saying, “way the hell out there”. East of east is El Monte, Whittier, La Puente, Walnut, Diamond Bar, West Covina, Claremont, Pomona, Chino and beyond… San Bernardino, Riverside, the Inland Empire. But its also Pacoima, and Wilmington. In short, east of east is all the people, places and histories beyond the scope of Los Angeles’ main cultural centers. East of east, can be a barren terrain, or it can be a place of expansive possibilities. The South El Monte Arts Posse proposes that east of east is ripe ground with untamed voices and visions. In our inaugural show, How’s the Water?, we turned our gaze inward, deep into our personal and communal cultural hinterlands. We made, installed and exhibited original photo work inspired by the inhabitants and geographies of El Monte/South El Monte. Ironically, in our eastbound ventures, we found ourselves in a thriving arts community in downtown Pomona where SEMAP will be exhibiting How’s the Water? in the Downtown Metro Pomona Gallery on 2nd Street for the entire month of March. This arts community consists of a serious arts colony, strings of galleries and artist studios. 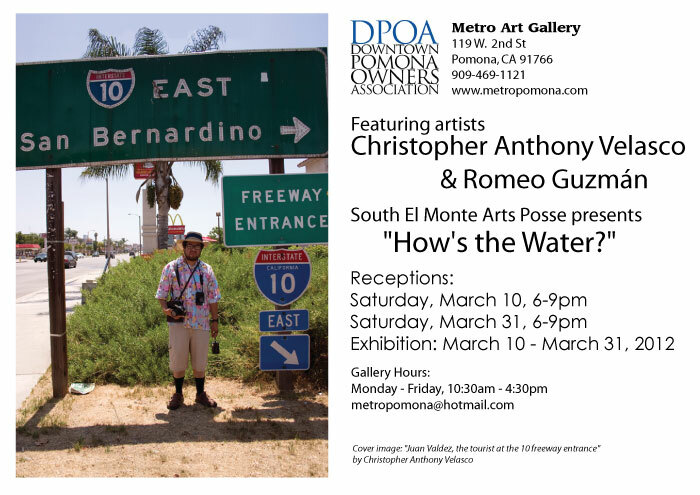 We will be participating in Pomona’s art walks on March 10. Although Pomona lies deep in eastern territory, well beyond the east-west divide marked by the Los Angeles River, its thriving arts community is evidence of not only its cultural richness, but also of an overlooked history that largely credits the City of Los Angeles proper as the master of a cultured civilization, with its theaters, movie houses, museums and galleries. Today, most of Los Angeles and Southern Cali’s significant cultural institutions remain firmly planted on land west of the L.A. River. However, El Monte, and all its east of east brethren is a landscape lush with creative possibilities and fertile with its own cultural idiosyncrasies and histories. We, SEMAP, invite you to nourish the creative minds that inhabit the east of east and come out to How’s the Water? next month in Pomona. This entry was posted in Art, How's the Water?, South El Monte and tagged East of East, Pomona on February 22, 2012 by South El Monte Arts Posse. i will be there, even though i am hello out of there! It is very nice to see this kind of events and eye opening reminder of how is the water. in other words where are we or what are we doing. Great Job Romeo and Caribean. As one who comes from east of Pomona, east of Riverside and even east of Beaumont, I am consoled by the energy and innovation of SEMAP. You will speak well of those and that which are east of the city where they say the angels live. Thank you for turning the reading light on out there. I like it: take the 10 until you’re out of gas and really hungry, and stop to see what’s cooking! Wow, thanks for sharing, BJ. I like that eastbound approach! What’s east of Beaumont?